Peru recently received an $11 million grant from the NAMA facility that will help the country attract significant funding for its multi-billion dollar sustainable urban transport improvement plans. Photo by Anton Muhajir/Flickr. Peru was recently awarded €9 million ($11.14 million) for its urban transport Nationally Appropriate Mitigation Actions (NAMA) by the German and British NAMA facility. This climate finance award will allow the Peruvian government to leverage $50 million from development aid agencies – especially KfW, the Inter-American Development Bank (IDB), and CAF Development Bank of Latin America – and much more from the private sector. This money will fund the Peruvian urban transport NAMA, called Trans-NAMA, an ambitious package of infrastructure investment, new climate-friendly regulations and institutional reforms that will reduce Peruvian greenhouse gas emissions from the transport sector by four million tons of CO2-equivalent over the next decade and improve quality of life. This is equivalent to the emissions reductions from taking 760,000 cars off the road for a year. Peru’s Trans-NAMA has been jointly developed by the Peruvian Ministries of Environment and Transport, with support from GIZ-Transfer, the World Resources Institute (WRI), the Low Emissions Development Strategies Global Partnership (LEDS-GP), Pontifical Catholic University of Peru (PUC), Transitemos, and other local partners. This award reflects Peru’s leadership in addressing climate change through the transport sector. As national leaders at COP20 look for ways to reduce greenhouse gas emissions, Peru’s efforts highlight the role of sustainable, integrated urban transport in curbing emissions at the country and city-level and demonstrate the potential for NAMAs and climate finance in general to complement large-scale investments in low-carbon infrastructure. Peru’s total GHG emissions are only a small fraction of the global total. However, the country’s emissions are expected to rise rapidly as its population and economy grow. While 40.9% of emissions come from the forestry sector, transport represents the largest share of overall energy-related emissions at 40%. The average Peruvian vehicle fleet is 14 years old, resulting in high specific emission levels, and the number of vehicles has nearly doubled between 2000 and 2014. As a result, transport-related emissions increased by almost 50% in the last decade. While 60% of trips in Peru still take place on public transport, private vehicle use has been rapidly increasing, causing severe road congestion – traffic moves at a sluggish 14 km per hour (8.6 mph) on average – as well as air pollution and traffic crashes. The social cost of congestion in Lima alone is $7 billion per year. Current problems will be aggravated if the trend towards car-dominated cities and metropolitan areas continues. Peru’s NAMA aims to reverse this trend by providing high-quality public transport and optimizing the country’s vehicle fleet. The impact of these actions will be broadened by explicitly targeting selected medium-sized cities adjacent to the Lima metropolitan area and at the national level. 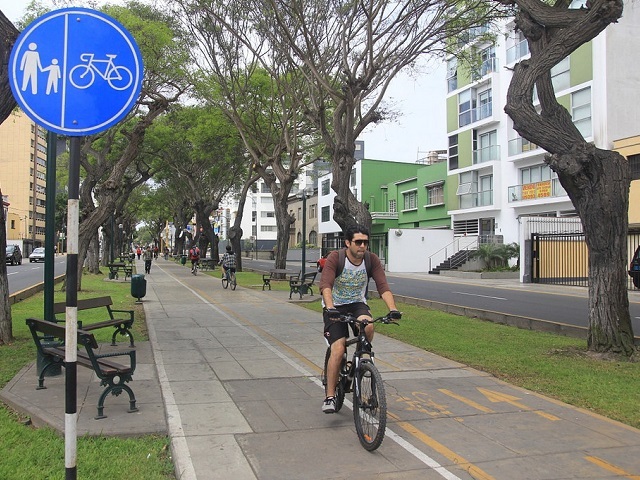 To deal with the challenge of rising vehicle ownership, Peru plans a multi-billion dollar effort to encourage sustainable transport by expanding bike lanes and Lima’s metro system, strengthening transport regulation such as fuel economy standards, and advancing institutional reforms to ensure comprehensive governance over urban transport. While the NAMA grant will supply only a small part of funding needed, it will significantly improve Peru’s ability to attract public and private financing. On December 4, 2014 the Inter-American Development Bank announced plans to provide at least $1 billion in loans for Lima’s metro. Most of the planned improvements will be concentrated in Lima and Callao, home to about 30% of the Peruvian population and the country’s economic hub. Some 60% of Lima’s residents use public transport, and an expanded metro line will help maintain this share. In addition to reducing GHG emissions, the Peruvian Climate Action Plan shows that more sustainable transport can save an estimated 18 million hours of travel time, reduce air pollution, improve public health, give better access to public transport, enhance social equity, and cut down on traffic accidents. T-NAMAs present a unique opportunity for developing countries to receive recognition and support for efforts to curb GHG emissions from transport. T-NAMAs get away from the traditional project-based approach to embrace a policy or sector approach. This new tool can rely on the globally recognized Avoid-Shift-Improve framework. More cities are using T-NAMAs to pursue sustainable, low-carbon transport. Though most are concentrated in Latin America, stakeholders from cities worldwide are increasingly engaged in T-NAMA preparation. Peru’s NAMA award comes at an opportune time, as national leaders from around the world look for an agreement on long-term climate action in Lima. Global transport emissions are increasing faster than any other sector, and nearly 90% of the growth in carbon dioxide emissions from transport is expected to occur in non-OECD countries, making it increasingly important for national officials to learn from Peru’s leadership in combating climate change through sustainable transport.